SPT Offshore is an independent offshore contractor that specialises in suction pile foundations and self installing platforms (SIPs) for the development of marginal oil and gas fields and offshore wind farms. Furthermore, SPT Offshore provides suction piles, suction pile clusters (SPCs) and suction embedded anchors (SEAs) for the mooring of floating units (FPSOs, MOPUs, buoys, FSUs etc), subsea structures and subsea pipelines. SPT Offshore has a staff of skilled and professional personnel from project managers and project engineers, geotechnical, structural and marine engineers and naval architects to experienced offshore installation crews. Furthermore, SPT Offshore owns and operates a fleet of 20 suction pump units for the installation of suction piles and SEA anchors on a rental or supply basis from shallow (5m) to deep water (3,000m). Through SPT Offshore’s sister companies, we operate a fabrication yard (VSF) and marine base (Stemat) in Rotterdam, including a fleet of (DP2) vessels, a crane barge, barges, tugs and piling equipment. SPT Offshore’s quality and safety management system has been certified to ISO 9001:2008 standards and OHSAS 18001 standards by Lloyd’s Register. SPT Offshore has developed several proprietary self installing platform (SIP) and floatover concepts. These offer cost reductions and scheduling flexibility in comparison with conventional heavy lift barges and piled platforms. As with installation, the SIPs are also easily removed and re-installed at other fields. Re-usable SIPs are the perfect solution for marginal field development. SPT Offshore has gained significant experience in the installation and relocation (for re-use) of various self installing platforms on suction piles in the Dutch sector of the North Sea and the Liverpool Bay area of the Irish Sea. In September 2010, we successfully installed the 10,000t F3FA platform for Centrica in the Dutch sector of the North Sea. The suction pile cluster (SPC) consists of three separate suction piles interconnected at the top and bottom. Each suction pile has a separate suction opening. By adjusting the suction pressures for each opening, the SPC can be installed with a tolerance on verticality of less than 0.5°, whereas a single suction pile has a typical tolerance of 3° to 5°. SPT Offshore has developed several specific suction pump units for this application that use state-of-the-art control software to reach this accuracy. SPT Offshore has a great deal of experience in the design, fabrication and installation of suction piles for the foundations of offshore platforms and subsea structures. The company has designed and installed the suction pile foundations of various offshore platforms and structures in a wide range of soil conditions from very soft to very stiff clays in loose to very dense sands, and in soils with cobbles and boulders and in layered soils including layers of sands, silts and clays. SPT Offshore is the most experienced offshore contractor for this type of application. For enquiries, please contact SPT Offshore managing director Mark Riemers. In the Dutch L6 sector of the North Sea, a minimum facility platform has been installed for the development of a marginal gas field. A primary objective of this project was to transport and install a minimum facility platform in one complete piece. Butch field is located in production licence PL405/405B on the Norwegian continental shelf in blocks 7/9, 7/12, 8/7, 8/8 and 8/10, 12km north-east of Ula and 18km north-east of Gyda fields. SPT Offshore has received the letter of intent (LOI) for the detailed design of the suction pile foundation, design supervision of the jacket and full transportation and installation (T&I) of the Ophir wellhead platform from Muhibbah Engineering (M) Bhd. This event is taking place between 3 and 5 November 2015 at the Swissotel Bremen, Germany. For the pipelay of three different Pemex lines (4, 7 and 9) in the Bay of Campeche, Mexico, SPT Offshore successfully installed and removed a twin suction pile three times at different locations. SPT Offshore has been awarded the design, fabrication and installation of the suction pile foundation for Statoil Siemens Dudgeon Transformer Substation to support Sembmarine SLP being the main fabricator for this substation. 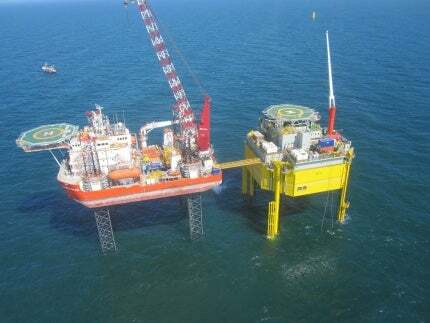 DONG Energy Wind Power A/S has contracted SPT Offshore for the installation and installation engineering of the suction buckets for DONG's demonstration tripod suction bucket jacket (SBJ) foundation as per of the Borkum Riffgrund 1 wind farm. Allseas has awarded the testing of the lift system for the Pieter Schelte to the joint venture of SPT Offshore and Volker Steel and Foundations. DONG Energy has contracted SPT Offshore for the structural and geotechnical design of suction bucket foundations for potentially five transformer substations, Burbo Bank Extension, Race Bank and Walney Extension. SPT Offshore, acting as subcontractor for Scaldis Marine Contractors, has successfully installed the three suction piles forming the foundation of SPT's tripod substructure and minimum facilities concept utilised for the Wintershall L6-B field development. SPT Offshore has been asked by the CLP Group to investigate the tensile capacity of a suction pile and compare it to its theoretical calculations. The CLP Group is one of the leading power companies in Asia. One of the goals of CLP is to install a wind farm offshore the coast of Hong Kong.